Get ready for some of the best food, music and service because....(Drum roll please. 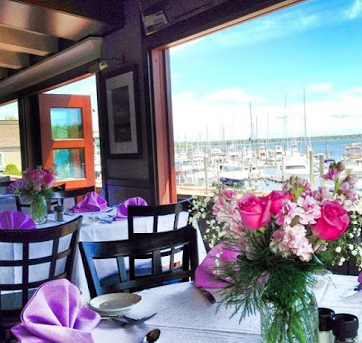 )......Nautika Restaurant and Bar on the water in EG is opening for the season on May 1st! If you have, best decision of your life, right? If you haven't, you need to go. My ALL TIME FAVORITE appetizer at Nautika is Mario's (the chef and owner) calamari. I have NEVER had better calamari in my life. Not kidding. What else do I LOVE to eat when I go there? The wings, the chicken arugula salad, the burger and of course, their FRIES (They're cooked perfectly. )...I could really go on for days because I love everything on the menu...At the very least, when you go, you know the food will always be absolutely amazing. What's the best part about going there, besides the food and the outstanding service (The staff is wonderful and will cater to whatever you may want or need.)? The MUSIC. So, if you love eating delicious food, having a drink or two (or maybe three), and listening to live music, all while on the water in nearby EG, this is going to be your spot for Summer 2015. I mean I love listening to music, singing (Scary, I know! ), and even dancing: Who doesn't though? You can sit by the water, eat, drink, and dance there. Tell me - What's better than that? Also, in case you don't already know, Nautika will host any kind of party you can imagine. From engagement to wedding and baby showers to graduations and bdays. Book yours today! Check out Nautika's website for more info. To see our other blogs about Nautika, click here and here.